WILLS POINT, Texas, Sept. 20, 2018 /Christian Newswire/ -- As political and religious divisions widen and deepen around the world, GFA (Gospel for Asia, www.gfa.org) hopes that a simple story of reconciliation and forgiveness will inspire more people to pray and work for peace. The account of how broken relationships were restored in a small Asian village through sharing the love of Christ is being highlighted to celebrate the International Day of Peace (Sept. 21). 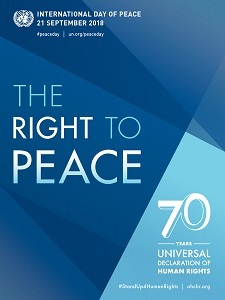 This year's theme for the United Nations observance is "The Right to Peace," marking the 70th anniversary of the Universal Declaration of Human Rights, which championed "the foundation of freedom, justice, and peace in the world." But that ideal is far from being realized, with the 2018 Global Peace Index finding "a world in which the tensions, conflicts, and crises that emerged in the past decade remain unresolved." The report marks the fourth consecutive year in which world peace—based on measures including crime, conflict and political instability—has statistically deteriorated. In the light of this discouraging trend, GFA is showing the way peace came to one community where its supported workers have been serving, to offer hope that small change repeated enough can lead to a big change. The example—just one from thousands of accounts of transformed lives recorded by GFA-supported workers—points to "the pathway to real peace," says GFA founder, Dr. K.P. Yohannan. "Peace at a national level is a wonderful and necessary thing, but even that cannot ensure peace in communities, families or the hearts of individual people," he says. "Rather, enduring peace must come from inside the hearts of men and women and work its way out." Posted at the organization's website, the inspiring story comes from a family living in Asia. The family of day laborers found themselves suddenly ostracized by their neighbors after being accused of being under the power of evil spirits. After being ignored by the rest of the community for several months, the family approached a believer in the area who was known for her prayers and faith, for help. "Scripture calls Christ the 'Prince of Peace,'" said Yohannan. "Our heart as his followers is to live the way he lived, and so we want not only to pray for peace, but to live a life of peace as an example for others to follow."